Healthy E Oil Liquid Supplement with a 1 ounce pump is an extract of Soybean Oil with is Not refined - meaning that all the key nutrients remain. It is an excellent source of energy (calories) 2.25 times more calories than shell corn. Puts a Shine on your horse's hair coal. 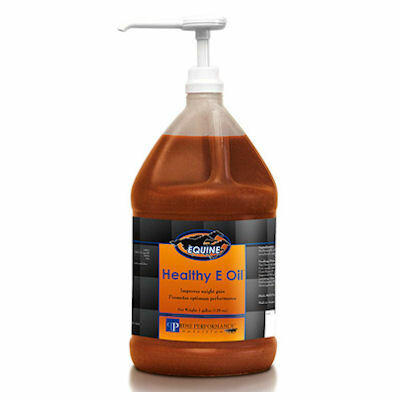 Healthy E Oil provides easily Digestible Calories that are absorbed in the small intestine not requiring any fermentation in the cecum and colon, keeping performance horses cooler in the summer and greatly reducing the incidence of Colic and Laminitis. Healthy E Oil decreases feed dust by 98% and can elminiate the need for liquid molasses in the ration. Helps all horses gain weight, it contains 1,000 IU per pound of Food Grade Natural Vitamin E for a stronger immune system and a faster recovery time after intense training. Helps to increase fat content in lactating mares milk for faster growing foals. Directions For Use. Top dress on oats or grain ration daily. Provide lots of clean fresh water at all times. Shake Well Before using, Pump dispenses 1 ounce per pump. Foals and Weanlings: 1 ounce daily per 350 pounds of body weight: Coat Shine: 2-4 ounces Daily, Weight Gain 4 ounces Daily: Performance Horses 6 - 8 ounces Daily, Lactating Mares 6 ounces Daily. GUARANTEED ANALYSIS:Fat 98.00% Min., Moisture Max 2%, Linoleic Acid Min. 5%, Vitamin E 1,650 IU/kg, min. Omega 6 Fatty Acids 51.00% min.,and Omega 3 Fatty Acids 5.50% min.